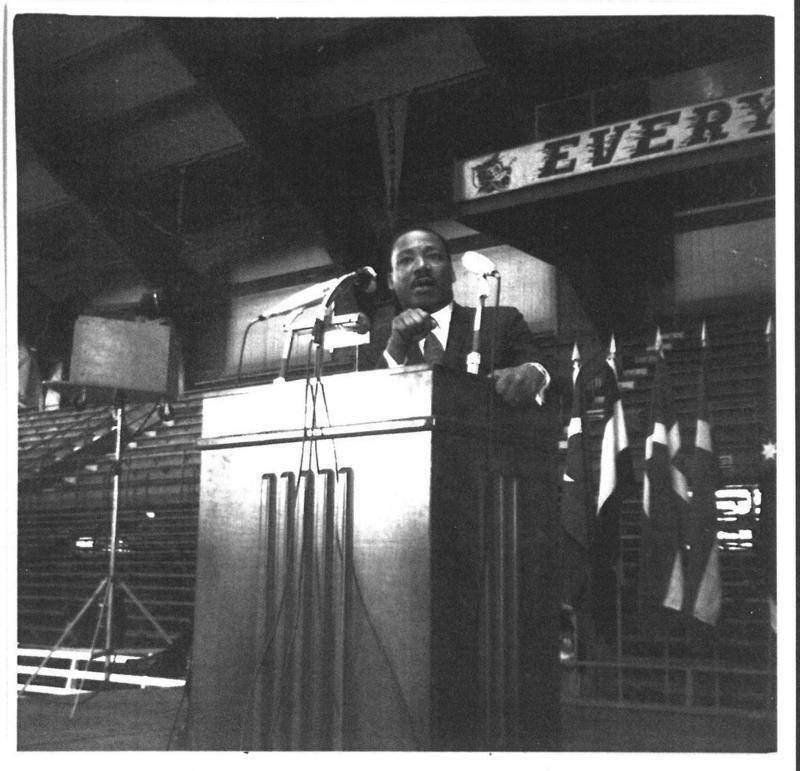 Martin Luther King, Jr. at K-State in 1968. On April 4, 1968, the radio and TV crackled with awful news: Martin Luther King, Jr. had been assassinated in Memphis, Tennessee. King would start his year at Kansas State University on Jan. 19, at a convocation in a jam-packed Ahearn Field House. King came away impressed and heartened by the students he met that day in Manhattan. But we didn’t know how impressed he was until decades later when hand-written notes about K-State were found in the suit jacket he was wearing the night he was shot. His words that cold morning in Manhattan are as meaningful today as they were 48 years ago. King’s speech was part lecture, part sermon. The first half was laden with facts and figures on poverty, unemployment and education. But then King transitioned from lecture to sermon. A King aid said the K-State speech was homiletics — the art of preaching. "As long as justice is postponed, we will be on the verge of social destruction." That was certainly true in 1968, but is it true today in Kansas? We asked Kevin Willmott, a professor at KU and a filmmaker whose films deal with race and social justice. He grew up in Junction City, Kansas, in the 1960s. "Dr. King being in Manhattan, I mean, that made you believe that the country was going to go towards King's dream. That that would maybe become the reality in American life. And everything that's been happening in the last few years, especially in Kansas, has told you that these people really don't believe in that dream. That the leadership doesn't maybe understand the dream; that they believe in a different dream. And that's the thing that's so frightening to people. That maybe there's another American that is growing right now, and certainly the President (Donald Trump) has become the symbol of that," said Willmott. Why haven’t we learned what King tried to teach 48 years ago in Manhattan? Well, really big thinkers have failed to answer that question, and maybe we never will. But perhaps it has something to do with political leadership. “Ultimately, a genuine leader is not a searcher of consensus but a molder of consensus,” King told the crowd. Archiver is an independent podcast produced by Sam Zeff and Matthew Hodapp for Fountain City Frequency with support from the Kansas Humanities Council. Diane Krauthamer is the digital intern for KCUR 89.3. For nearly 50 years, the Rev. Nelson "Fuzzy" Thompson fought for civil rights in America and abroad. Thompson was a follower of Martin Luther King Jr. and a major proponent of nonviolent protest. Thompson was laid to rest Saturday, just two days before Martin Luther King Day. We caught up with those who knew Thompson best at his memorial service. Kansas City Remembers Martin Luther King Jr.
Kansas City, MO – Voices include singer Mia Ramsey, the Reverend Nelson Thompson, poet Laura Taylor, the Reverend Wallace Hartsfield, poet Glenn Lewis, the Lee A. Tolbert Community Concert Chorus and educator Carl Boyd. Leaders from the Southern Christian Leadership Conference and other civil rights groups in Kansas City are promising that the city's annual Martin Luther King Jr. Day celebrations will continue in the absence of The Rev. Nelson "Fuzzy" Thompson. Thompson was laid to rest Saturday, just two days before MLK Day. The long-time civil rights activist had a big hand in organizing Kansas City's events honoring the life and work of King.